The Flying Eagle Cent was the first US small sized cent and was used from 1857-1858 when the coin was discontinued due to issues with the minting of the coin. The coin gets it's name from the eagle on the obverse and was the first US coin that did not feature Liberty on the obverse, the design was originally intended for use on a Silver Dollar and it's intricacy lead to production issues due to the presence of high points at the same place on opposing sides of the coin. To showcase the coin more than a thousand pattern pieces were struck in 1856 prior to the official beginning of the Flying Eagle's mintage to allow congressman and senators to see what the design would look like. 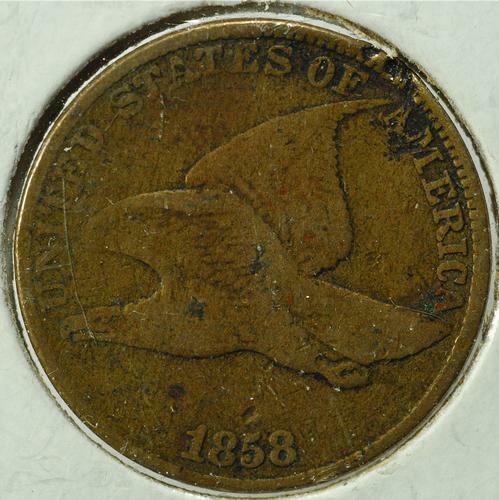 The Flying Eagle was struck from 88% Copper and 12% Nickel and as such were much lighter in color than previous Pennies that had been struck from solid Copper.